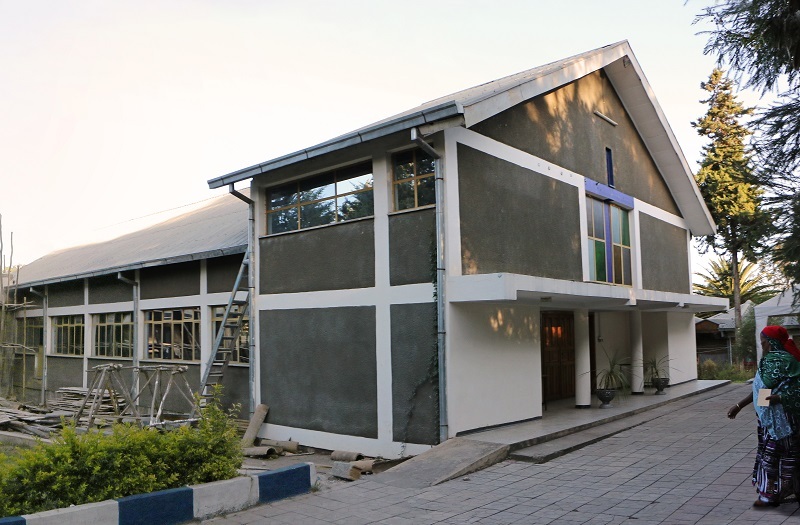 Ethiopia’s northern Tigray State is considering adopting a new law that would restrict Christian activities to within official church compounds, rendering illegal the activities of smaller churches that do not own their own buildings and gather in houses. The law, if passed, would most affect Christians from outside the Ethiopian Orthodox Church because any church that wanted to have its own land would need to prove that it had at least 6,000 members – a greater number than the total population of non-Orthodox Christians in the state. The law would also ban Christians from evangelising outside of church compounds. Local church leaders have raised their concerns about the law with the state government but have yet to receive a reply. A similar law was recently ratified in neighbouring Amhara State which, together with Tigray, is home to most members of the Ethiopian Orthodox Church, and local church leaders fear other states will copy the move. Over the past decade Ethiopia’s religious map has changed considerably. For centuries Ethiopia, which some argue was the first nation in the world to accept Christianity, consisted of an Ethiopian Orthodox Christian core, a Sunni Muslim zone in the east, and an animist/indigenous-faith area in the south and the lowland reaches of the far west. In the last 10 years, indigenous faiths have diminished, in most cases yielding to Protestant Christianity, which is said to be the fastest-growing religious group in Ethiopia. This is making the country home to “one of the fastest growing evangelical churches in the world”, wrote theologian Allan Anderson in 2014. Some former members of the Orthodox Church have also become Protestants, creating tension between the two communities. While Ethiopia’s increasingly controlling government seeks to further restrict religious institutions, to prevent dissent, Christians also face oppression from family members and the local community in other parts of the country, for instance in the Afar and Somali regions where ethnicity and Islam are interconnected. 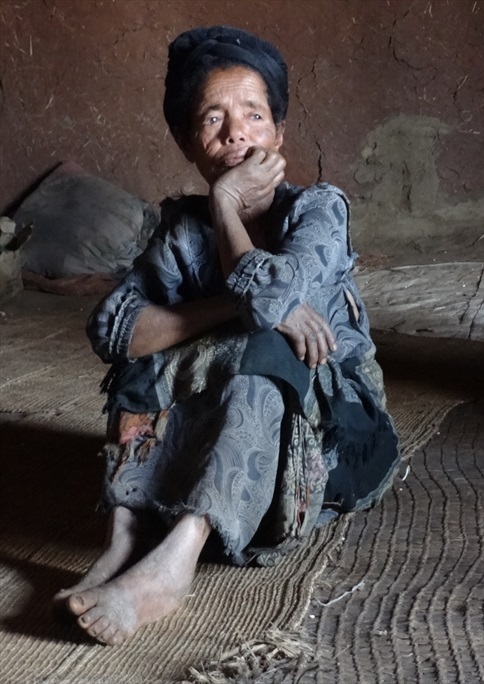 An example is the story of Tutu, a widow, and her son, Biruk*, who live in a Muslim-dominated community in the south-western state of SNNP and have faced troubles since Tutu’s husband passed away, 18 months ago. After his burial, local Muslims dug up his body and dumped it by the side of the road. In January, Biruk was assaulted and told that he and his mother would continue to face trouble until they converted to Islam. On 4 March, their house was burned down. Tutu and Biruk’s story is not uncommon. Generally, attacks on Christians in Ethiopia seem to be increasing. 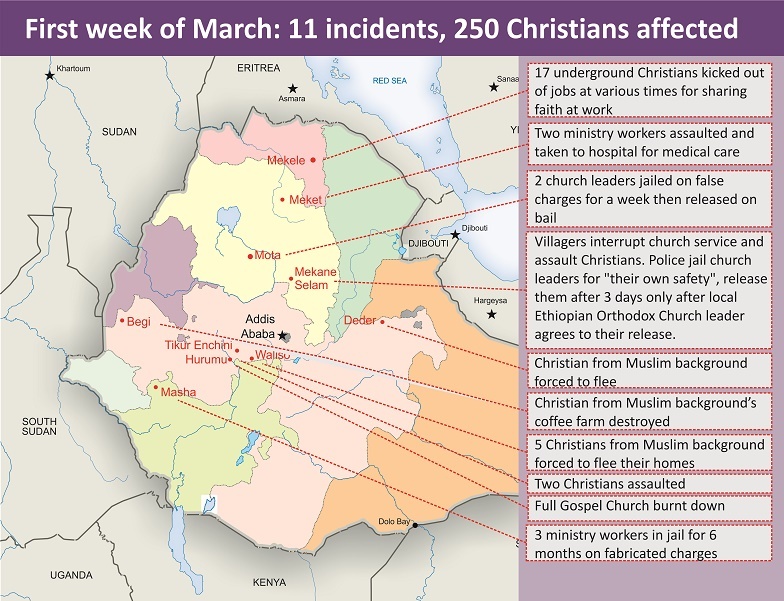 According to reports received by World Watch Monitor, in March alone there were 11 attacks on Christians, affecting approximately 250 people (see map below). The judicial system also often works against Christians in Ethiopia, particularly in areas where they are the minority. For example in February three Christians, falsely convicted and imprisoned for burning down an Ethiopian Orthodox Church building in the rural community of Gulema Iyesus in May 2014, were acquitted by the Supreme Court and freed, but still ordered to pay for damage to the church, valued at the equivalent of over US$40,000 at the time of sentencing.